*Known as "flying tank," the Apache was designed to destroy invading Soviet tank columns in Europe. It is fully equipped for night fighting and is the primary attack helicopter in the Army. It has been plagued by technical problems at home, but commanders in Desert Storm report a much higher readiness rate than they experience during peacetime. Iraq flies a number of attack helicopters under the Army Air Corps, but the primary system is the Mi24 HIND designed by the Russians and used effectively in Afghanistan. The HIND carries built in machine guns along with a wide variety of missiles and rockets. It can also transport eight combat troops. Iraq also has a number of French-built Gazelles and American-designed Hughes 500 although these are not as well-armed as the AH-64. In Operation Desert Storm, the Apache was called on to perform its primary mission of tank-killing and did so with tremendous success. In some of the first attacks of the air war, Apaches attacked Iraqi command and control centers for air defenses on the border. Using the laser-guided Hellfire missile, Apaches destroyed a number of tank and armor units prior to the ground invasion. In one of the more interesting attacks of the air war, two Apache's were successful in forcing some 400Iraqi prisoners to surrender just prior to the start of the ground war. When the ground war commenced, Apaches provided close air support to advancing allied forces, destroying a considerable number of Iraqi tanks. 274 AH-64's were deployed to the KTO. 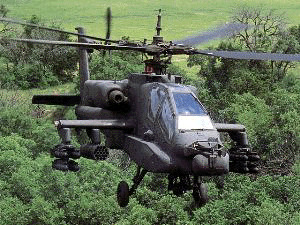 This represented 45% of the Army's AH-64 fleet at the time. AH-64's flew over 18,700hours with a readiness rate of over 90 percent. One AH-64 was lost to enemy fire, but its crew was recovered. Sand was a major enemy of the aircraft, causing serious problems with auxiliary power unit, environmental controls and shaft dirven compressors.